A First Floor Luxury Apartment situated within a secure gated community within the desirable residential area of North Hykeham. The property benefits from a communal gated parking area with bin store and secure telephone entry system, with Communal Entrance Hall, Stairway and Landing leading to; Private Entrance Hall, Living Room, Fitted Kitchen, Three Double Bedrooms and Family Bathroom/WC combined. The added benefit of a secure allocated parking space is also provided. Viewing of this apartment is highly recommended to appreciate the size and condition of the accommodation on offer. LOCATION The property is conveniently located to the south of the historic Cathedral City of Lincoln and is located within the desirable residential area of North Hykeham. The property has easy access to a range of local amenities, with a park, schools, shops and supermarkets within a close proximity. The property is conveniently positioned for access into Lincoln City Centre to the A607 towards Grantham or to Newark via the A46. COMMUNAL ENTRANCE HALL With stairway and landing providing access to the private property entrance. ENTRANCE HALL With wall mounted secure telephone entry system and lighting to ceiling. LOUNGE 15′ 8" x 12′ 1" (4.78m x 3.68m) With window, radiator, six spotlights to ceiling and two wall mounted lights. KITCHEN 8′ 3" x 7′ 7" (2.51m x 2.31m) With tiled flooring and fitted Kitchen to comprise a range of wall, drawer and base units with a fitted laminate work surface and splashback tiling. Integral stainless steel sink and drainer unit with central mixer tap, stainless steel four ring gas hob, electric oven, extractor fan and integral fridge freezer and washing machine. Light fitting to ceiling, window and wall mounted gas boiler. MASTER BEDROOM 12′ 8" x 8′ 5" (3.86m x 2.57m) With window, radiator, spotlights to ceiling and built-in wardrobes with full-height sliding doors and mounted hanging rails and shelving. BEDROOM 2 13′ 9" x 7′ 4" (4.19m x 2.24m) With window, radiator and spotlights to ceiling. 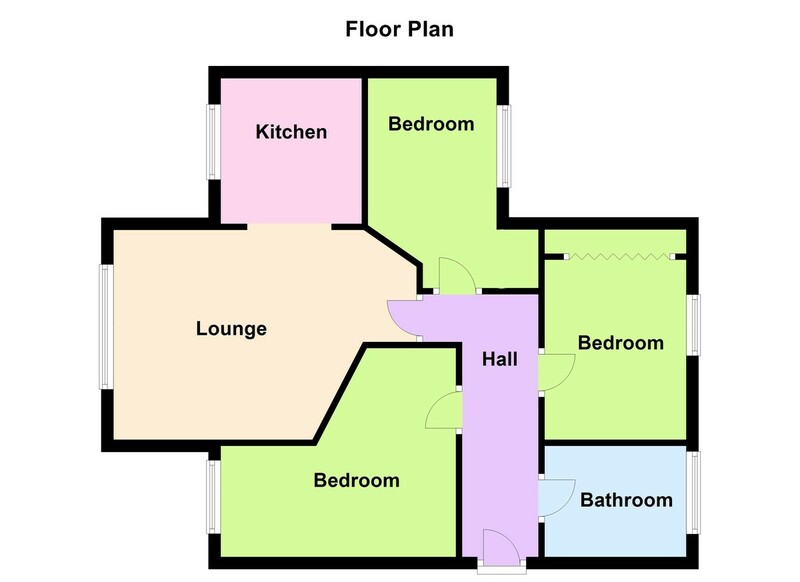 BEDROOM 3 14′ 5" (max) x 9′ 5" (max) (4.39m x 2.87m) With window, radiator, spotlights to ceiling, wall mounted consumer unit and built-in wardrobe with double doors, mounted shelving and hanging rail. FAMILY BATHROOM 8′ 4" x 6′ 0" (2.54m x 1.83m) With modern bathroom suite comprising of; hand basin, WC, bath with mounted shower over, shower screen, wall mounted heated towel rail and extractor fan to ceiling. OUTSIDE Gated access provides vehicular and pedestrian access to the site from Lincoln Road. A block-paved communal car park and bin store are present and the property benefits from a single allocated parking space. TENURE Leasehold. Ground Rent £10.00 and Service/Maintenance Charge £77.00.